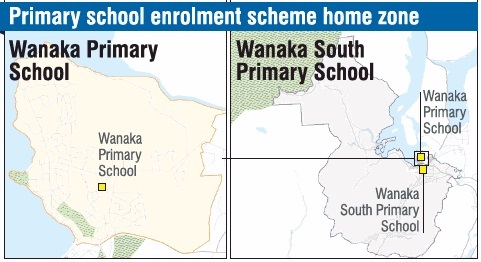 New primary school enrolment zones have been proposed for Wanaka in preparation for the opening of Wanaka South School in 2020. The new zones, which will likely be adopted bar any major objection, will see the town split into two. Wanaka Primary School's zone will cover a small but heavily-populated area between Ardmore St and Aubrey Rd, near the edge of Albert Town, while the Wanaka South School zone will extend from the airport right up to Cardrona township and the Matukituki Valley. The zone of the new school will also include Albert Town and the central Wanaka area west of Ardmore St.
Hawea Flat School's current zone will remain unchanged, covering the Hawea, Hawea Flat and Luggate communities. While this will result in a drastic change, Wanaka Primary School board chairman Andrew Howard said current students and younger siblings would still be able to attend the school despite being outside the zone to "ensure minimal disruption during the transition period''. Wanaka South School's establishment board chairman Ian Hall said a public meeting would be held on December 4 to provide the community with further information on the proposed zones, although noted the zones were virtually set in stone at this point.